Do you use cemetery records to trace your family tree? Are you curious to know what historic buildings were still standing in the 1930s? Why was a mural painted in the post office in a Virginia town? Who built the state parks and their rustic cabins? What did a woman in Appalachia think about her life in 1938? Answers to these and other questions can be found because of government programs that put men and women, black and white, young and old, blue collar and white collar, to work during the Great Depression of the 1930s. Some of the projects yielded collections of materials that we still use today in genealogical, historical, sociological, and cultural research. Faced with massive economic collapse and widespread unemployment, President Franklin D. Roosevelt and the United States Congress initiated a variety of government programs, known collectively as the New Deal, during the Great Depression. These programs, often known by their initials, built roads, public buildings, and airports; sponsored music, theater, and mural paintings; documented popular art and historical records and buildings; and employed millions of people, including women and teenagers, not only to teach skills but also to keep job skills in the workforce. Legacies of the New Deal in Virginia offers overviews of two major components of Roosevelt's New Deal—the Civilian Conservation Corps and the Work Projects Administration—whose achievements continue to enrich our lives. 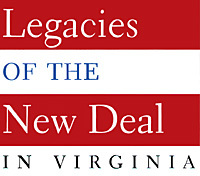 See a list of selected resources or the bibliography The New Deal in Virginia (pdf).